Words in BOLD BROWN are links. 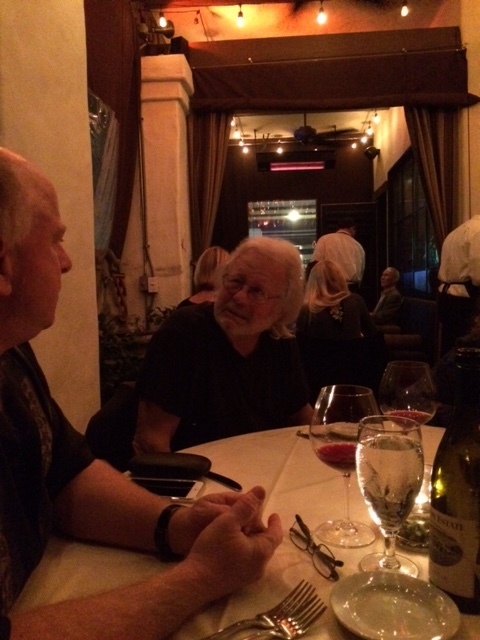 Last night, we celebrated Richard Clark’s birthday – Richard is the winemaker of the Conejo Valley Wine Co-op, which I have blogged about in the past. 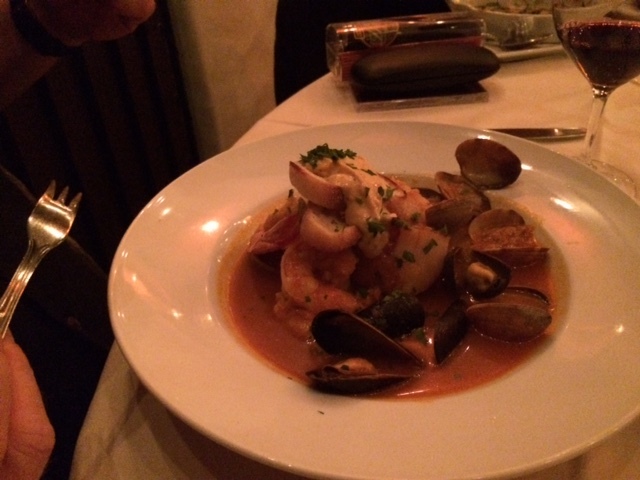 So six of us went to Cafe 14 in Agoura Hills, CA, a restaurant known for good food and good wine. Richard brought a bottle of Clos Pepe Pinot Noir 2012, a very nice wine made by one of the better craftsmen in Santa Barbara County, Wes Hagen. The wine did not disappoint, as Wes’ wines never do. His Pinots are rich, made in the Burgundian style, with some creep toward the fuller California style in recent years. 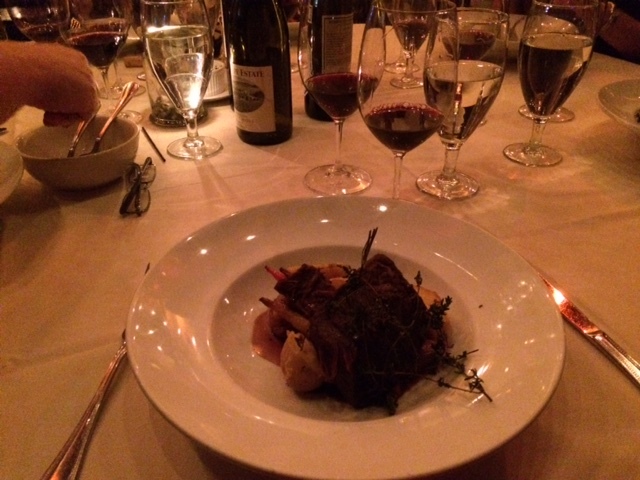 Next, we ordered a bottle of 2012 Rombauer Zinfandel. 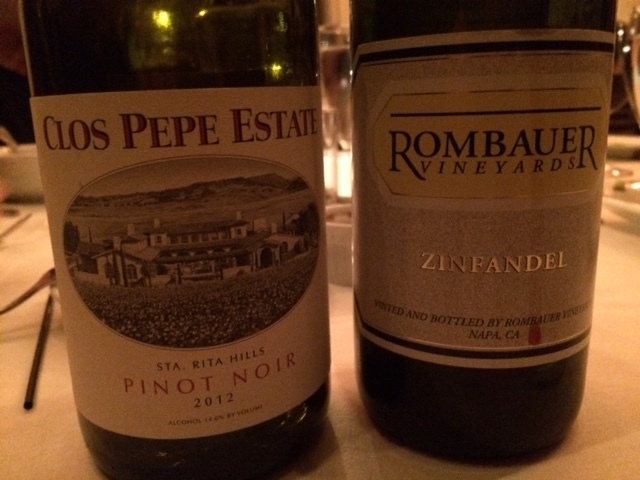 The last Rombauer Zin I had was the 2010. Rombauer makes big wines and is probably best known for their Chardonnay, which is a classic rich, buttery version of that varietal. I also am a fan of their Merlot, which is often a bargain in restaurants. This Zinfandel was a surprise – very rich, almost syrupy, with strong overtones of caramel and vanilla. Everyone at the table agreed that it was too sweet for dinner. Oh, and it weighed in at 15.9% alcohol. The heat of the alcohol came through, even with all the sweetness. I was surprised because I remembered the 2010 Zin as being more restrained. We set it aside to save to have with dessert. 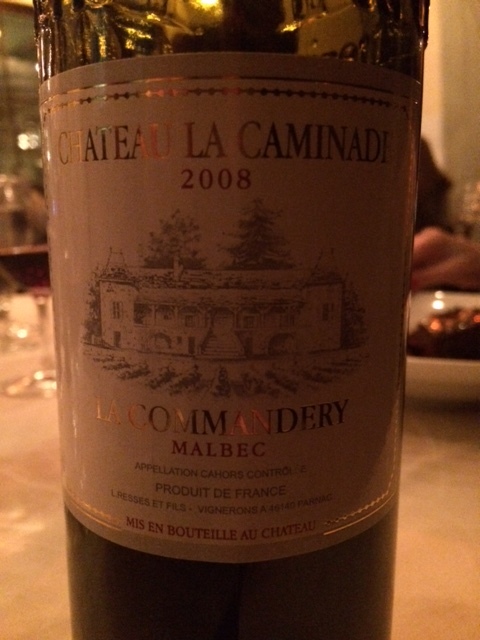 So on to a third bottle, a 2008 Chateau la Caminadi La Commandery Malbec from Cahors, France. The Malbec was a perfect compliment to the dinner. Dry with hints of dark fruit, it balanced well, even though a couple of our party were having fish. Not a great wine, but a very drinkable wine. The food at Cafe 14 is very good. The service tonight was a bit slow – hard to tell exactly why. The wine was delivered to the table after a delay because, apparently, only the bar tender can go to the wine storage area to get wine and the bar was busy (? ), a questionable policy. As a result, the waiter ended up taking the $20 corkage fee for the Clos Pepe off of the bill to apologize for the slow wine service. Dessert was a caramel pot-au-feu with creme fraische – so rich that we could only eat a bite or two each – but delicious. The Rombauer Zinfandel was a good accompaniment to this rich dessert.